Almost everyone who has ever published a post on the Steem blochchain has probably noticed that you receive a bunch of small upvotes a couple of minutes after your post goes up. These upvotes come from accounts that are running automatic curation bots, usually on specific tags. Since they're voting before the 15 minute mark, they're actually losing most of their curation rewards to the author of the post. I was wondering how much they were actually earning from this type of behavior, the results surprised me to say the least. Thanks to Steemworld it's very easy to check how much these accounts are making on a daily basis. You first have to check which accounts are automatically upvoting your posts right after they've been published, then you check their accounts on Steemworld to see how much curation rewards they're reaping in. Which accounts are running curation bots? I'm going to take my latest post as an example, there I see that I've received around $0.05 worth of upvotes from many different accounts. All within less than 10 minutes after publishing my post. Most of these accounts have their voting percentage set to less than 5%, with their upvotes being worth less than $0.02. Surely, they can't be making a lot in terms of curation rewards, right? Wrong! 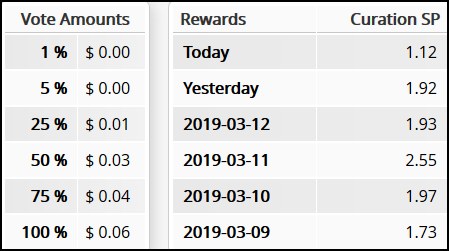 After checking out these account's Steemworld pages, I was absolutely flabbergasted to see that they're making more than 1 Steem per day, just from curation rewards. Some of these accounts don't even have 1000 SP! I was playing with the idea of setting up a new account, purely for getting curation rewards like the above accounts do. After some research, I found out that there's really no easy way to set something like this up. When I say easy, I mean point-and-click, scripts that automate these actions are fairly easy to find. With some basic knowledge of programming they're very easy to set up. While it might be very lucrative in terms of curation rewards to just upvote all content that's published under specific tags, this practice does go against the concept of proof-of-brain. It's not really curating content, you're just upvoting everything to maximize curation rewards. This is why I ultimately decided against setting up my own curation bot on a different account. The geek inside me finds these systems incredibly interesting to look at, so I don't mind writing about them. It's really up to your own moral compass, whether you want to engage in such practices. I have to admit that I was pretty amazed to see how lucrative these auto-voting systems really are. I have my wife's account setup as an autovoter since she never posts anything. She used to answer questions on Musing, but the quality there has really went downhill since they lost their delegation. Plus it just isn't worth her time anymore. All that being said, the autovoting her account does, is on accounts and trails that were manually curated by me. I've never just had her account blindly vote on specific tags nor would I ever. For your information the part that goes to the author doesn't goes to the author anymore, they go back to the reward pool. Yeah, I've come to that conclusion as well after reading the comments. Seems like the FAQ on Steemit.com isn't updated to include changes of HF20. Oh dang, guess I'm done using that information :-/ They should really keep it up-to-date, I absolutely hate referencing wrong information. Sorry about that btw, it wasn't my intention. Info about HF20 is just so scattered and I never know who's right or wrong. I'll have to look into this further, to work out what the difference is between these autovote curation bots, and the kind of autovoting I set up for accounts that I particularly like, when I know I'll probably be away sometimes when they post, and I love their work. I'm guessing it's the frequency and the number of posts these bots vote for. I don't think my posts attract many of these bots, though I may be wrong... I rarely get round to checking these things. Having said all this, I see this as all part of the fantastic, amazing game that is Steemit. 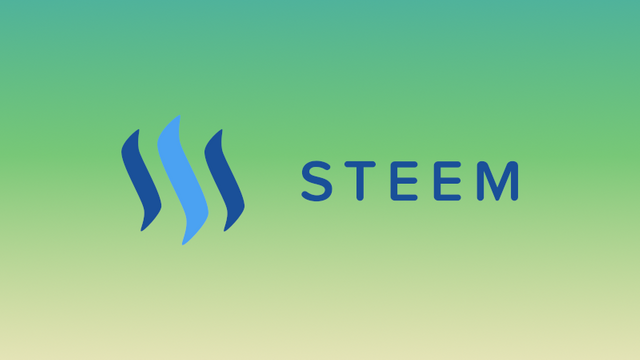 I personally use Steemit to try and write quality posts and hopefully get some attention for them, while reading the quality posts of other Steemians, and earning a bit of pocket money! One thing I love about Steemit is the investment aspect. Most people buy Bitcoin for speculation, in the hope that the price will rocket. But Steemit offers so many different ways to make your investment work for you, whether the price is going up or down. I think this is one of the big advantages of the platform, and it should be valued. I don't like seeing outright abuses of Steemit - crap being bidbotted into Trending, circle-jerking etc. But bots making money by regularly upvoting posts that people put effort into producing? That seems like a good thing to me :) Maybe I'll give it a go if I can work out how! Thanks for another eye-opening, thought-provoking and informative post! Crikey! That’s both equally fascinating and a little disheartening that the system can be played so easily. Like you say, it’s all about your moral compass and objectives. I’m not techy-minded at all... but it’s interesting to think that IF I had the knowhow to set up an auto-curated account - whether I could resist it or not. I've just been reviewing curation myself - @steevc put me onto this as I'd noticed the same via beempy.com - some of those small accounts are getting a 200% + return by voting early. I don't really understand how it works and I'm not sure about the ethics of it either, but like you find it all fascinating! Yeah I really don't understand why they're getting so many curation rewards. There isn't some sort of minimum curation reward, right? I mean, that's almost what it looks like to me. I did a test where I altered my 9K (at 20%) auto vote on one post to around 7 mins as an expt and my CR is down to 60% so it doesn't work for larger accounts. On the same post my 50SP alt account got a 200% return voting at 3 mins. Maybe it is min return? Or perhaps it's the ratio of large votes to smaller votes coming before hand? Hmm, that's really interesting to say the least. Calling @andrarchy to make sense of this situation. I hope he keeps track of his mentions. Question for him if he's on @pennsif's radio show on Thursday! NB - they're the figures before pay-out, they may change. Damn man, that is quite the return. I too assumed with the sp they had and the voting percentages used that they wouldn't be gaining much. Exactly my thoughts as well, until I had a look for myself. Plus, they're upvoting after 3 minutes, so they're giving most of their curation rewards to the author. Very surprised to see these results. I wonder if they have genuinely fiddled with the timings to maximise their return and decided that was the best saying or they just pumped for as early as possible to gazump others. Personally I have found 10-12 mins to be the sweet spot! Yeah I do think some of them really tweak the timings to get maximum curation rewards. 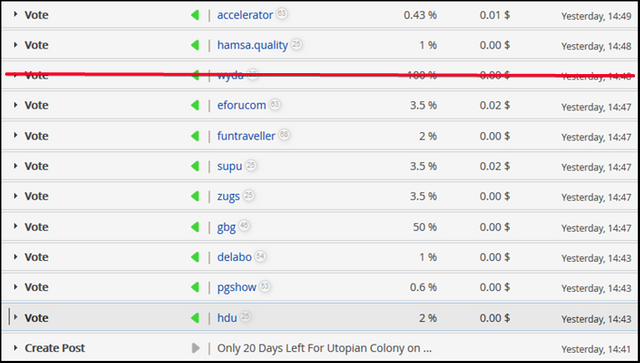 I really had no idea that you could earn almost 1 Steem per day consistently with only 700 Sp (like that HDU guy). I earn only 1 SP day and i have over 8,000 SP. But thank you for information, i want to bild a bot upvoting my coummunity members. Me neither. That's a huge amount relative to sp. I can feel an experiment coming on!! I am not that bothered about whether I get their votes if they are not interacting, but it seems they are just exploiting my posts for their own profit. I guess there's not much we can do about it. I think those changes applied to all voting, although the primary use case was to mitigate the fact that early self votes by authors received a huge advantage. 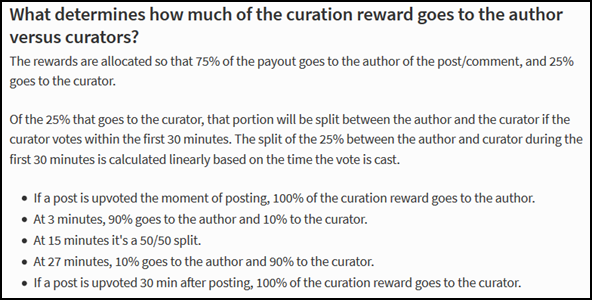 As of the hard fork, the pre 15 minute curation percentage that would previously have been going to the author should now be recycling back into the rewards pool instead. Ah, good to know. I've read a couple of conflicting statements about this. Makes sense that it applies to all votes though. Yeah, on a blockchain level I don’t believe there’s any way to differentiate between self/outgoing votes, but I could be wrong! I've still got these votes on my latest post even though I declined rewards, so they wasted their votes on that. Interesting. Perhaps those scripts have no way of differentiating between posts that have declined payout and those that haven't. I felt I had to post something as I wasn't seeing anything about it on my feed. I'm tempted to post more opinions on world events as all this crypto stuff is less important really. It's not about scoring points. Yeah back when the new copyright directive of the EU was all over the news, I also felt the need to share it here. I didn't really see much about it on Steem, while it was getting pretty popular on other social media websites. Don't get me started on 'trending'. I rarely go there. We need to be wary of Steem just being a filter bubble. I want to see more diverse content. I have posted about important issues before and I'll accept that it may put some people off me. Whatever I get is ploughed into SP, so it can help with our minnow promotion project. Those people are missing out if they don't post much, but I guess they have passive income. I just looked at one the ones I get yesterday and found it getting 6 sp a day. I think with 3000 sp. The votes I get are way smaller than yours. I can have 5 votes and still no reward at 10 minutes. I do not think the author gets the reward though for those early votes. I think it goes back the to reward pool. Somewhere I read this changed at the last hardfork. I thought this was only the case for self-votes before the 15 minute mark? Could be wrong though. Well, I am not sure either. Obi-Wan-Asher @abh12345 always likes it when I ask him for help, and this is his type of topic. Maybe he will chime in and let us know the real truth :). I find this fascinating as you say it goes against everything our brain is telling us. 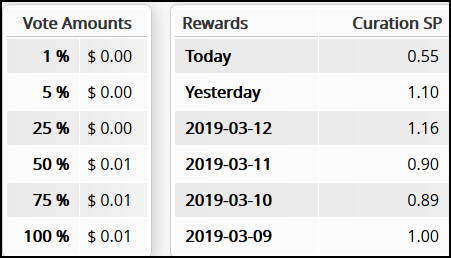 Curation earnings are important and can be worth their weight in gold done correctly and these accounts are playing the system wonderfully well and I am impressed. 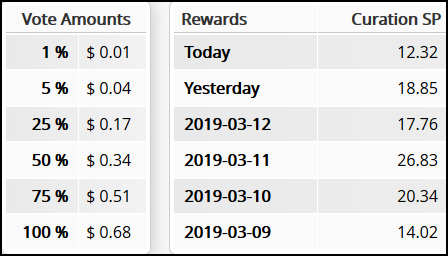 Your UA account score is currently 4.121 which ranks you at #3306 across all Steem accounts. Your rank has improved 20 places in the last three days (old rank 3326). In our last Algorithmic Curation Round, consisting of 225 contributions, your post is ranked at #50.